No major problem: the solt-in CD drive is the sole piece to be dead. 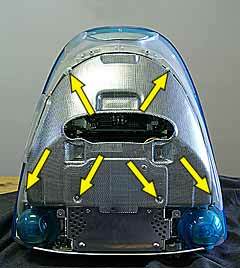 (3) check the internal battery. 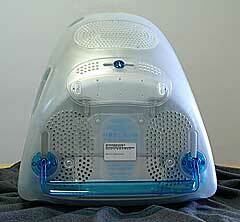 The machine: one of the first slot-in on the market... no firewire! 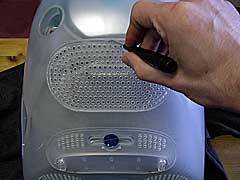 For more recent slot-in (with FW), it is more easy (and often less expensive) to use an external FW burner. However, this latter solution is less aesthetic and more cumbersome. 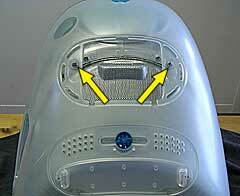 We put the machine as on the picture: the screen down onto a soft tissue to avoid to scrape it. We open and unhook the trap door (with a lever or a flat screwdriver). Two cruciform screws to be removed. 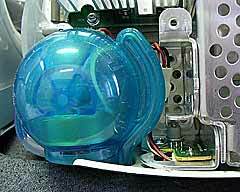 The other trap door, which allows access the RAM modules and the possible airport card, is locked by the colour cylinder. There is no need to dismount all the machine to access these parts! Again, two small cruciform screws to be removed. The cockle can be unhooked from its upper part following the movement shown by the arrow. Unhook it smoothly but firmly: we can face a little resistance until we hear a bright sound indicating that the hooks which maintain the cockle are disengaged. 6 small cruciform screws which clamped the armouring have also to be removed. 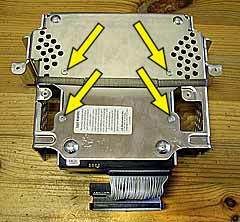 Removing this armouring case is easier on this kind of iMac because of the lack of a VGA port (the yellow arrow shows the missing VGA controller). On the left, a little bit below the black radiator, on can see the internal battery. 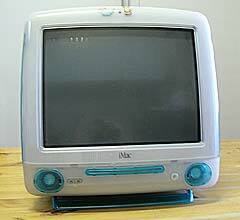 The same view... but of a dead iMac in which we withhold pieces. The yellow arrow shows the VGA controller and the blue one the cutting-out in the armouring -> so, when remouving the armouring on such a machine, we have to lift it up to avoid it hitches the controller. And here, no battery on its support. 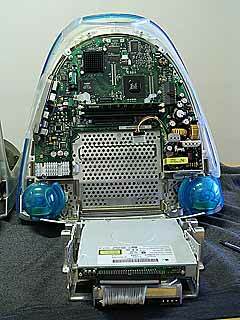 On the left the dead "benefactor" iMac (a DV 450 MHz) and on the right the machine to be repared (a 350 MHz). 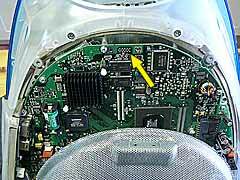 The DV iMac has no upper cockle: we removed it in the past to diagnose a problem (the machine does not startup (no illuminated led). 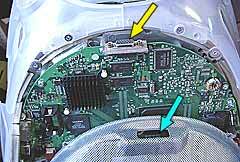 We remove the power cable (yellow arrow) and the IDE connector from the mother board (blue arrow). 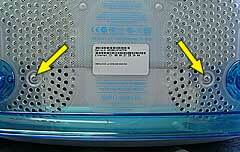 The white arrow points to the reset switch. 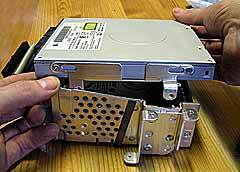 We now remove the hard disk-CD drive common craddle (4 screws). The two right ones: do not damage the cables! When the screws are out, we can unplug the connectors and extract the craddle. ... and their twins on the left ;-). 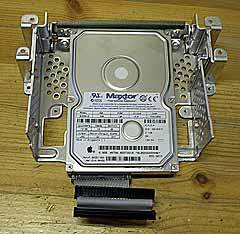 We unhook the IDE ribbon which is connected to the hard disk. ... and extract it from the craddle. 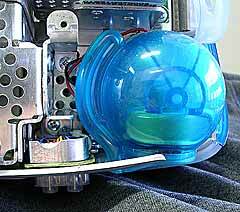 The hard disk still fixed on the craddle. 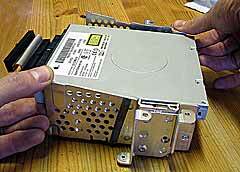 We upturn the whole stuff to unscrew 4 screws which liberate the hard disk. We can put a bigger one: it has to be put in master mode. 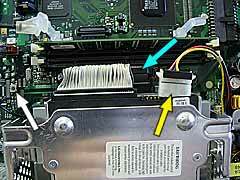 We recuperate the IDE cable because it contains wires dedicated to power the CD drive! 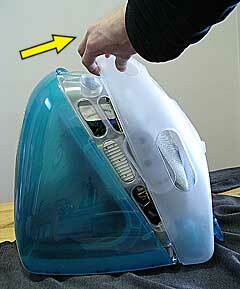 As usual, follow the instruction above in a reverse order to rebuild the iMac. 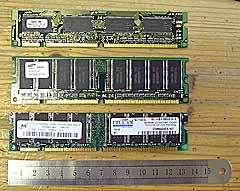 3 RAM modules: two 64 original MB on the top, a 512 MB module under!